This map came about when I read Marty's post on MapHugger entitled "The Cartographic Aesthetic." He posited that maps intentionally retain a precise visual language in order to appear authoritative, "rejecting the inclusion of any appearance of human touch" due to it's inherent imperfection. Included in that post was this beautiful map from the 1940's of Great Britain. I was enthralled with the style. I had to replicate it. Using Adobe Color I extracted the key colors from the map. Good cartography is 90% data, 5% preparation, and 5% luck. Looking at the legend, I knew that the data would be extra tricky in this case. Not only were some of the terms foreign to me, some were extremely specific. Where do I find the "Moorland" data for the US? Where are all the food processing plants? Smelting facilities? Cement factories? Is there a map of potteries? If there was data for all of this, I couldn't find it. The hunt for data begins. The original contained data too obscure or specific for me to easily include in my map, so I had to figure out an alternative vision for what my map could be. I decided to start with the background. 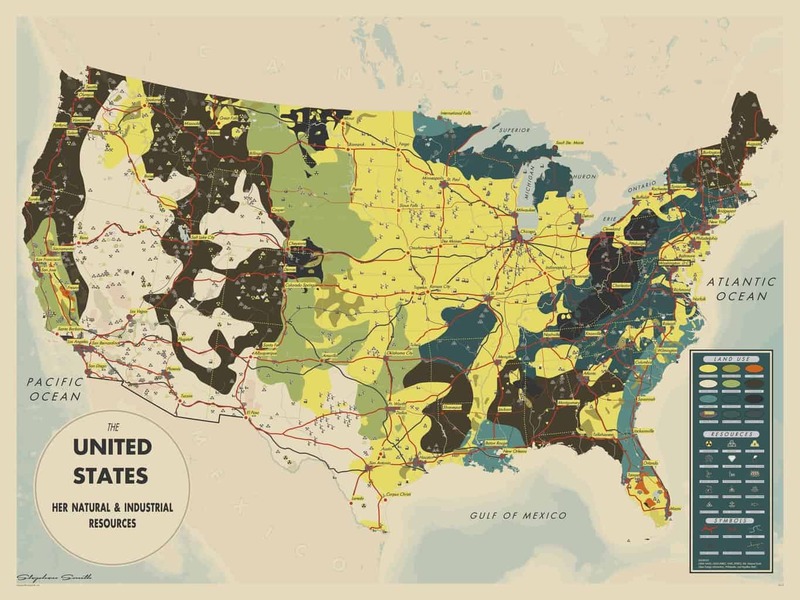 The original contains flowy, generalized, land use/land cover data. That's easy enough to reproduce for the United States. This amazingly rich dataset contains a wealth of information about the land use of the lower 48 United States at 30 meters per pixel. The legend is extensive, containing 125 possible values, from corn to cantaloupes, apples to watermelon, and perennial ice/snow to dense urban. But how to take advantage of this data? It looks really nice as-is, but the original map had much more general categories and shapes. Inspired by the other items in the original legend, I started hunting for relevant datasets that would fall under the "Natural & Industrial Resources" theme. Looking in the "Industries" section, I thought it would probably be possible to find mining related data somewhere. After some searching I came across the United States Geological Survey (USGS) Mineral Resources Data System (MRDS), which is a "collection of reports describing metallic and nonmetallic mineral resources throughout the world." Perfect. I should be able to find things like granite and cement and iron in there. That's a lot of dots. To keep things simple, I reduced this gigantic dataset down to a few key categories. The map still looked massively cluttered, so I used Esri's Cartographic Representation system to Disperse Markers to make them more readable. The % represents the modulo arithmetic operation, which returns the remainder after a division operation. In this case, the defition query divides the OBJECTID by 5 and returns the remainder. The result being that only features with OBJECTID's ending in 0 or 5 were displayed, reducing the clutter by 80%. "You can't just decide to eliminate data from your map because it's too cluttered!" I'm happy to share this striking, award winning, world famous map with you completely hassle free! Below is a 5K, high definition version for you to download! Just click the image below to get the 5K jpg for your personal use. It's perfect for all your desktop wallpaper needs.